For seed collectors, spiny seed pods are literally a pain. 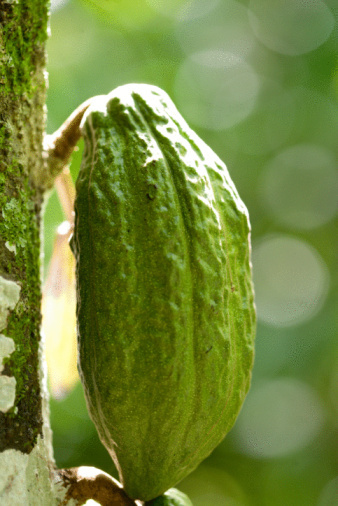 Picking the pods can be a challenge, and then opening them to retrieve seeds can be unpleasant. The spines do serve a purpose in the plant world because the sharp projections help deter hungry herbivores from accessing the seeds. Some spines also can serve as holdfast organs, attaching to animal fur or people's clothing to disperse the seeds away from the mother plants. A close-up of a wild cucumber. If you plant a tree with spiny fruits, plan its placement so pod litter isn't a problem. Chinese chestnuts (Castanea mollissima) are suitable for shade and specimen trees, growing up to 40 feet tall with a broad canopy. Spiny chestnut burs follow fragrant small, white spring flowers arranged in catkins. 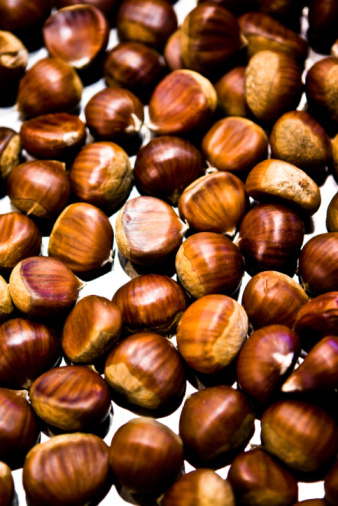 Chinese chestnut grows in U.S. Department of Agriculture plant hardiness zones 4 through 8. Valued for its vivid fall foliage in tones of red, purple, orange and yellow, sweet gum (Liquidambar styraciflua) can grow to 80 feet tall in USDA zones 5 through 9. Small yellow-green flowers appear in round clusters at the ends of stems that dangle from the branches. The spiny, round gum ball fruits turn dark brown as they mature. Slender-stemmed vines either clamber or sprawl. Wild cucumber (Marah gilensis) grows each year from a large perennial, underground tuber. Small yellowish to white flowers appear on the weak-stemmed vines in early spring, followed by inflated, pale-green prickly fruit. Wild cucumber is hardy in USDA zones 9b through 11. 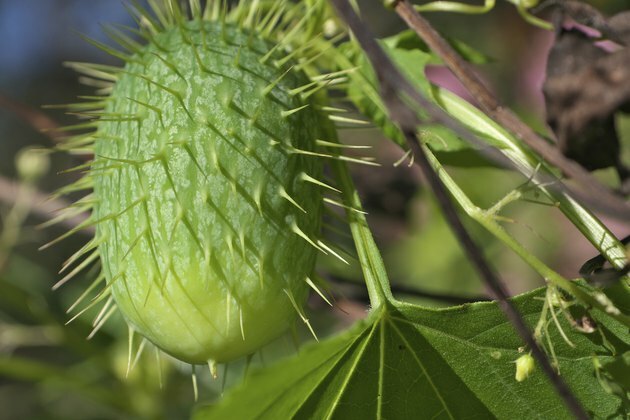 A mat-forming vine with truly vicious spines on the seedpod, puncture vine (Tribulus terrestris) penetrates bicycle tires, shoes and fur to hitchhike to new territory. An accidental introduction from the Mediterranean region, puncturevine is an aggressive grower that is considered invasive. Yellow, five-petaled flowers appear along the stems within three weeks of germination. It is hardy in USDA zones 4 through 11. Annatto (Bixa orellana) grows in warm winter areas, hardy in zones 10 through 12. The sharply spined pods somewhat resemble chestnut burs, but they open to reveal seeds embedded in orange pulp. The pods are not only ornamental enough for use in dried arrangements; the orange pulp, called annotto or achiote, is used to color food. The pink-flowered shrub, which grows 6 to 12 feet tall and wide, creates an informal hedge. Nickerbean (Caesalpinea bonduc) is a clambering shrub that grows up to 20 feet long. Occurring in warm winter areas of USDA zones 9 through 11, yellow flowers occur at branch ends year-round. Prickly, flattened pods turn from green to brown, each containing two or three gray, round seeds. Perennial plants remain in the landscape year after year, often dying back in winter. For white, showy, fragrant flowers in abundance during summer, consider angel's trumpet (Datura inoxia var. quinquecuspida). Hardy in USDA zones 8 through 10, the plant grows anew each spring from underground roots in zones 8 and 9. The round, spiny fruit is sometimes called a thornapple. All plant parts are poisonous. Place hoarhound (Marrubium vulgare) in xeriscape gardens or herb gardens in USDA zones 3 through 10. It can become weedy. White flowers occur in whorls on stems that rise above the felted grayish leaves. The small seed pods have spiny edges that serve as sticktight dispersal structures.